Why do freedom fighters don long hair? 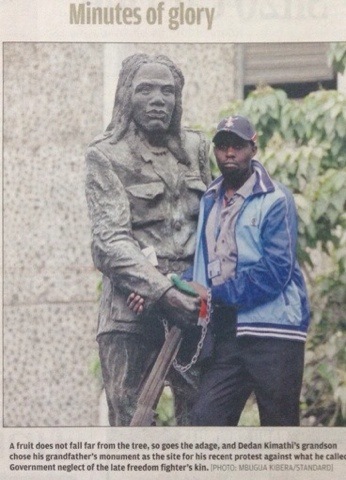 Field Marshal Kimathi wa Waciuri monument at Kimathi street Nairobi. The article below set me thinking. In the early nineties, Sally was married to a licensed psychologist who worked at a VA Medical hospital. He worked with combat veterans with PTSD, post traumatic stress disorder. Most of them had served in Vietnam. Selected men were extensively documented as experts in tracking and survival. With the usual enticements, the well proven smooth phrases used to enroll new recruits, some of these Indian trackers were then enlisted. Once enlisted, an amazing thing happened. Whatever talents and skills they had possessed on the reservation seemed to mysteriously disappear, as recruit after recruit failed to perform as expected in the field. When questioned about their failure to perform as expected, the older recruits replied consistantly that when they received their required military haircuts, they could no longer “sense” the enemy, they could no longer access a “sixth sense” , their “intuition” no longer was reliable, they couldn’t “read” subtle signs as well or access subtle extrasensory information. The recruit is sleeping out in the woods. An armed “enemy” approaches the sleeping man. The long haired man is awakened out of his sleep by a strong sense of danger and gets away long before the enemy is close, long before any sounds from the approaching enemy are audible. In another version of this test the long haired man senses an approach and somehow intuits that the enemy will perform a physical attack. He follows his “sixth sense” and stays still, pretending to be sleeping, but quickly grabs the attacker and “kills” him as the attacker reaches down to strangle him. Hair is an extension of the nervous system, it can be correctly seen as exteriorized nerves, a type of highly evolved “feelers” or “antennae” that transmit vast amounts of important information to the brainstem, the limbic system, and the neocortex. For the original article and some very interesting comments see link below.